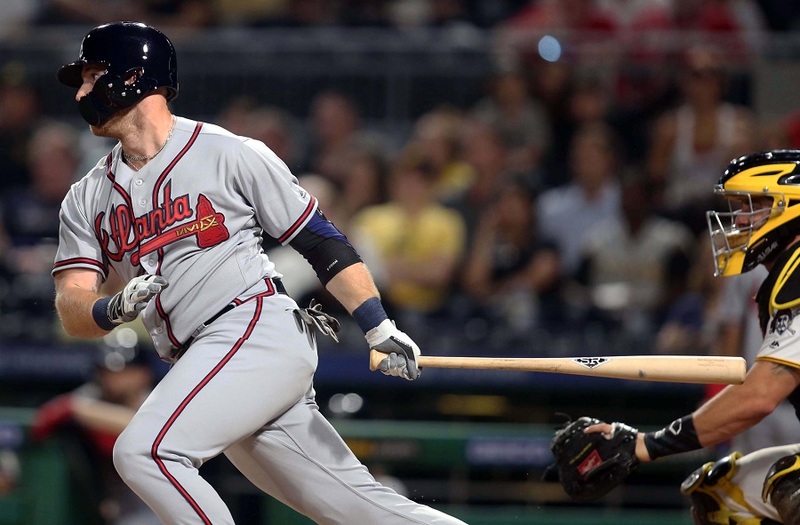 The Twins announced on Wednesday that they have claimed outfielder Michael Reed from the Atlanta Braves. Reed was born in Maplewood, Minnesota. He played in seven games for Atlanta in 2018. He had previous big league experience with the Milwaukee Brewers in 2015 and 2016. The 25-year-old Reed played 44 games at Double-A Mississippi and hit .314/.446/.493 (.939). In 53 games at Triple-A Gwinnett, he hit .363/.459/.539 (.997). Combined, he hit 26 doubles and 11 home runs. Reed is a speedy outfielder who has always been able to take walks. He has shown some power. He is also a right-handed bat. With Eddie Rosario, Max Kepler and Jake Cave in a likely 2019 outfield, along with Byron Buxton, a right-handed hitting fourth or fifth outfielder could provide value. The move may tip the Twins hand on roster decisions of Johnny Field and Zack Granite, and possibly Robbie Grossman. Could Michael Reed be a similar story to Jake Cave? The Twins acquired Cave in a spring training trade with the Yankees. He was coming off of a big season, split between AA and AAA after struggling with injuries early in his career. Both could be late bloomers who provide value in the big leagues. Cave has shown more power, while Reed has better defense and on-base skills. Claiming players off of waivers is not going to excite a fan base or provide a future star, but this could be a solid depth move for the Twins outfield, particularly if the front office has any plans to deal an outfielder this offseason. This looks like a solid pick. Good numbers in AA and AAA. If he is a better fielder than Jake Cave (not Jake Reed as the article stated), then this seems like a smart move by the Twins. Man, what got into this guy in the past year? Always a decent OBP guy, but avg. jump really spiked everything in 2018. That's a Kirilloff level OPS at AA/AAA (much higher IsoD than Alex). Hoping for lightning in a bottle? vs LHP Reed hit .409/.474/.561in AAA and .400/.531/.520 in AA last season.Cave had a.642 OPS vs LHP and .844 OPS vs RHP last season. I think that between the two of them, you might have a nice outfielder. Big spikes in OBP and SLG this year were driven almost entirely by his batting average, which jumped up to .342 from .262 prior career mark. BB rate was essentially static and ISO Power was up a bit but not enormously. So I'm a little skeptical as to the sustainability of his breakout but this still seems like a very solid pickup, especially with that Jake Cave context in mind. I’m seeing a trend with the front office. They definitely like grabbing AAAA / post-hype guys near their age prime. Robbie Grossman, Jake Cave, Tyler Austin, this guy. Doesn’t seem like a bad strategy. I'm fine with this if it's AAA depth. Please go get a real RH OF who can challenge Kepler for the starting job. Knowing the Twins, this will be the move; players like Adam Jones and McCutchen won't be considered. Looks to me like the Brewers pushed this guy pretty fast.Had a real nice year at Appleton in the Mid-West League when he was 20 with several solid seasons since.Played this year at 25 after breaking in with the Brewers at the age of 22. Expect they had to get rid of one of the excess outfielders to open spots before this move...releasing either Fields or Granite.Now expect both will be gone and they come to spring training with 6 outfielders, Rosario, Buxton, Kepler, Cave, Grossman and Reed...subject to any trades over the winter. Have no problem with that group, a group that still has the potential to be as good as any outfield in the league. Hey Vanimal, I think your bang on the buck for Jones and McCutchen would be limited. Guys on the wrong side of 30, used to commanding salaries of 14-18 million per, and in steady statistical decline. Jones was only 0.2 WAR last season. Rosario, a healthy reinvigorated BB, and around the corner Max is my wish list. Reed falls in after Cave, maybe alongside Wade in the pecking order. Depth is good. Any idea why Atlanta released him? They did not.They moved him off their 40-man roster and had to pass him through waivers to do so.Same way that Randy Rosario was picked by the Cubs.The Twins did not release him. So, does he have to be put on / kept on the 40 man?Is it like a Rule 5 draft thing? Yes, and like Atlanta they could take him back off the 40 and try to sneak him through waivers. I agree with this. We have promoted guys who are undeserving and other guys like Kepler are just left to "take their lumps" in hope that a light goes on and they figure it out.I am tired of this strategy. One huge problem we have had is literally no players in AAA.It is almost as though we have disregarded AAA completely.That is the next step and if there is little to no depth or competition there it fosters a weak culture.Buxton, Sano, Kepler....these guys need to feel the heat.They are not in need of more nuturing.THey have gotten that in spades. This generation of Twins needs to understand that where you were drafted and how much hype you have been given does not give you an endless leash.YOu need to perform and if you don't for long enough we are going to sit you down or demote you and find someone else who can play. Yeah. Reed's BABIP in the minors this year looked to be about .460. Which is impressive, but also nowhere near sustainable. We will need to expose him to waivers again if he is going to be in AAA, he is out of options.If there isn't an injury in Spring training or a move to clear some space we could easily lose him before he gets an AB,I don't think he is ahead of any of our current OF Rosario, Cave, Kepler, Buxton, or Grossman. His high AA/AAA average was driven by a crazy BABIP of .426 and .477.For reference Vlad Jr had a lower BABIP and higher Average.Reed found a hole nearly 50% of the time he put it in play, that doesn't seem realistic..477 is more than 100 points better than his next best season at any level. But I do like the pick up, especially if he passes thru waivers.I am not opposed to freeing up some space either.Grossman does not field well at all and it seems like a waste to have our everyday DH be an OBP minded player. Edit to add: Cave just used his first option year in 2018, so he still has 2 more. Not gonna turn this into a Kepler thread. My thoughts about him are in the thread dedicated to him. I'm not a believer. Reed was also repeating both AA and AAA last year. Not that he's super old or anything, but prior to his breakout last year, he already had 590 career PA at AA, and 640 more at AAA. Reed is also 16 days older than Jake Cave. He turns 26 on Nov. 18, while Cave do so on Dec. 4. Oh boy. This game again. I omitted any editorial comment in my reply. So expose him.....if they lose him, they never had him. No biggie either way most likely. Agreed. Do it immediately so he's not taking up a 40 man roster space all winter.